Believe it or not, I’d never been one for a “blood and guts” Halloween. That is… not until I starting blogging! After that I’d realized how much fun it actually is to come up with really gross ideas that surprise, delight and creep people out! This year I feel the need to come up with a few ideas that will rival (or top) last year’s RAT LOAF recipe. If you haven’t seen my rat loaf, you really must check out how much fun I had last year during the Halloween season. See, I told you I was moving over to the dark side. LOL But I digress… Back to my “Blood Suckers”. I was wandering around Michael’s Art’s and Craft store yesterday (hoping to be inspired) when this idea popped into my head. I immediately became so excited that I rushed home to make them right away. The best part about this recipe is that you will most likely have all the ingredients in your pantry already. Just like I did. -In a medium saucepan, combine all the ingredients and bring to a rolling boil over medium high heat, stirring often. 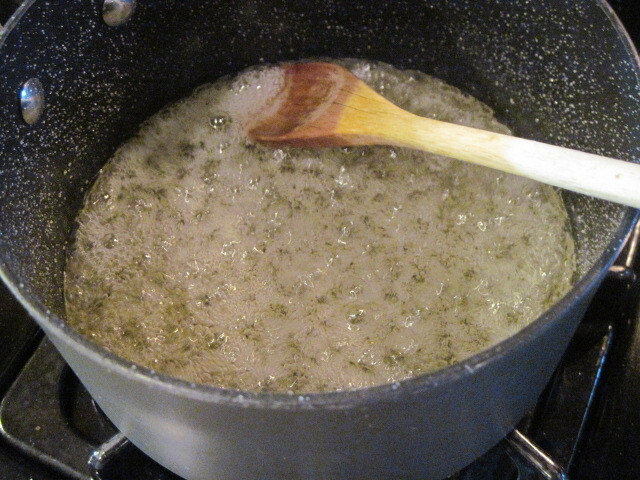 -Continue boiling and stirring for a full and complete 15-20 minutes until your sugar mixture thickens and begins to change color to a golden amber color. This is also know as the hard crack stage. You can use a candy thermometer to insure this stage, but I accidentally broke mine last year and have forgotten to replace it. 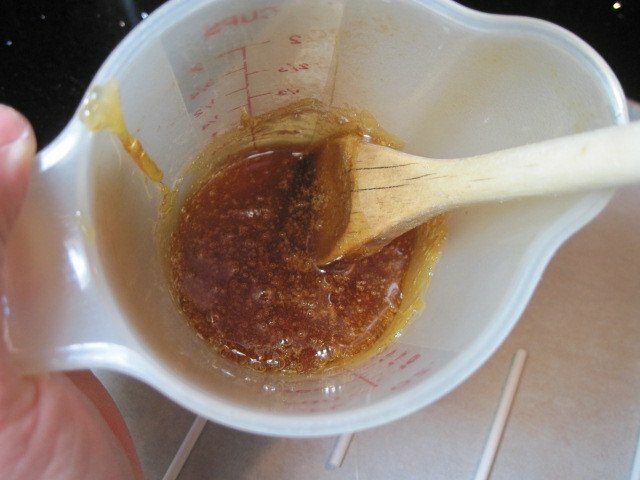 -When your sugar has reached the desired consistency and color, remove from the heat. –CAUTIOUSLY, add the lemon extract to the pot. 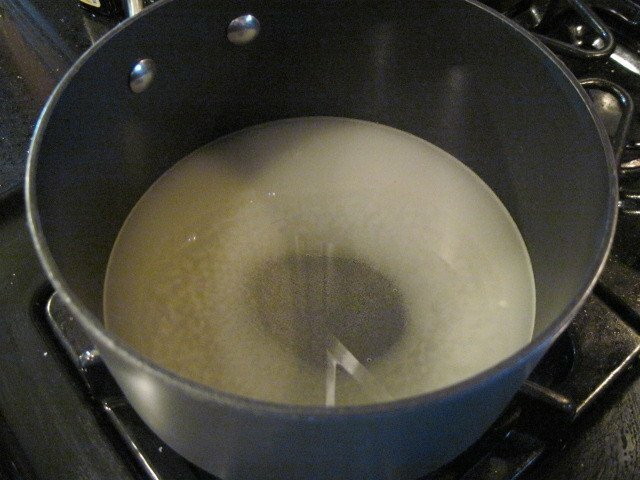 The addition of the lemon extract will make the sugar spit and sputter so STAND BACK as you first add it. -Stir your mixture immediately and transfer it CAREFULLY to a smaller device with a pour spout. 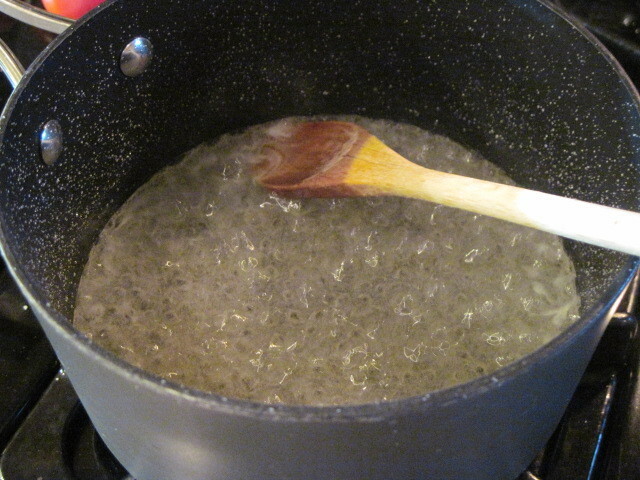 *NOTE – While working with boiling sugar syrup, you should always have a bowl of ice water handy in case of any accidental burns. 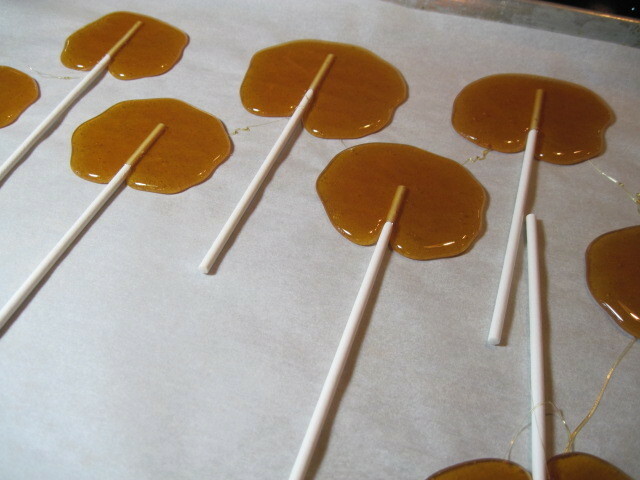 -Arrange your sucker sticks on your parchment lined cookie sheet. 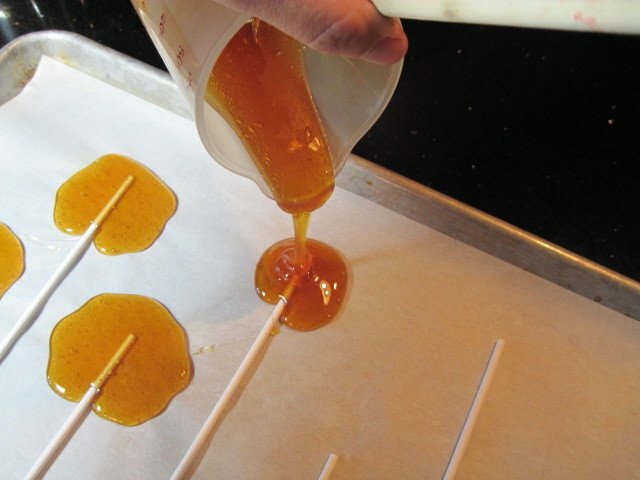 -Carefully pour your sugar mixture in a pool on the top of each sucker stick. 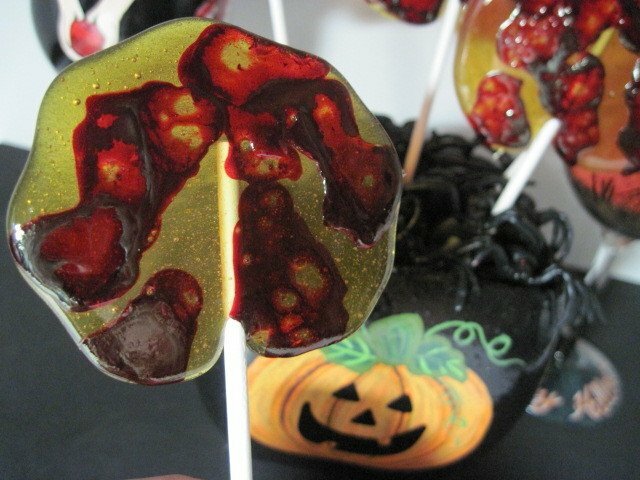 -Take the red food coloring and add it by drops onto your prepared sucker. 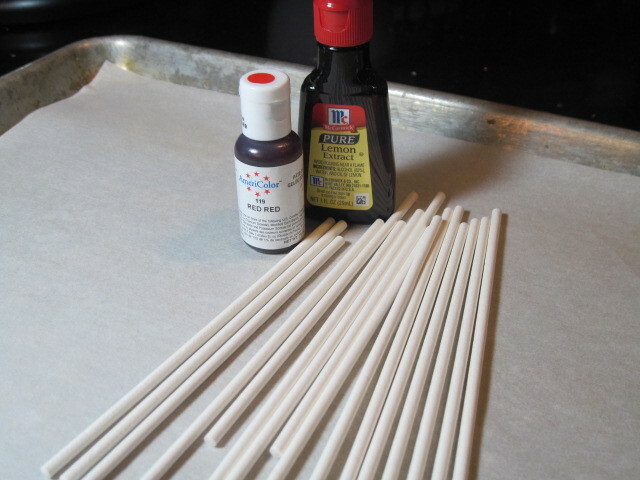 -Working quickly and using a straw, blow the food color gently around the sucker top to make it spread and drip. -Allow your suckers to sit until the sugar is set and firm. 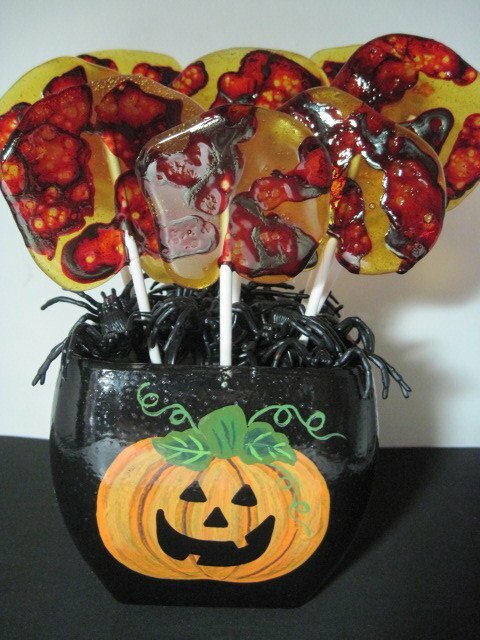 Here’s the best part… You are now ready for TRICK-OR-TREAT!!! The treat: a luscious lemon sucker. 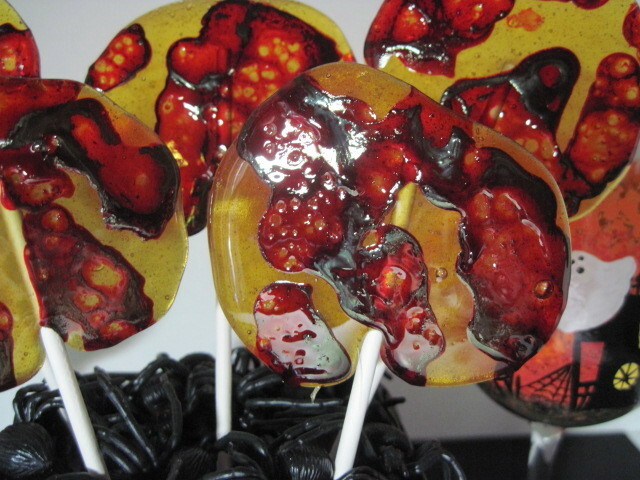 The trick: Anyone who eats one will be cursed with a *blood stained* mouth. Is that so wrong? These are seriously awesome. I have to try them this weekend! thanks!! 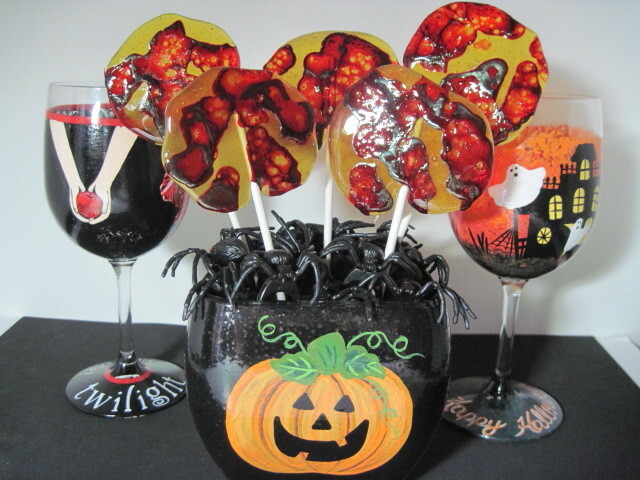 So, I saw this icon on a linky party and I was like "OOOOOO look someone is using a halloween jar painted by Renee!!" and I click on it, and it's you haha! 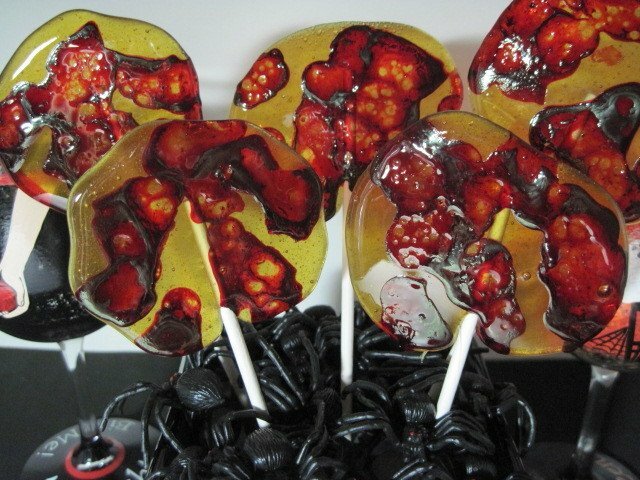 What a fun treat idea for the kids and served up in a bucket of spiders…perfect! Oh! I love to try this recipe. It seems easy to make. 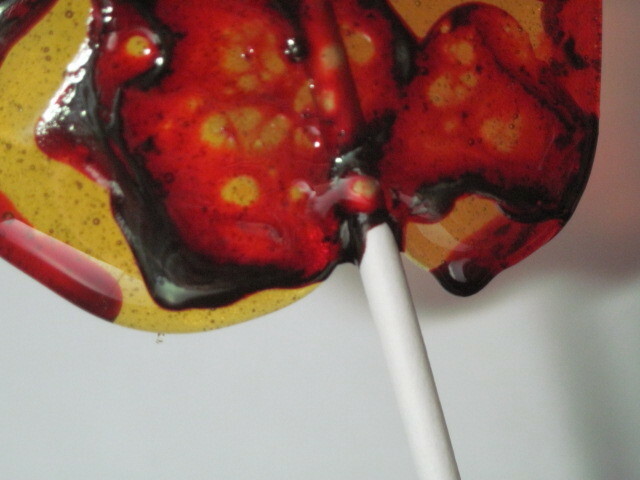 And I am glad you’ve included the recipe in making this yummy lollipop.